Pana in anul 2018 se apreciaza ca ~50% din traficul de date se va face pe device-uri mobile. Marketerii trebuie sa se adapteze tot mai rapid, sa-si mareasca echipele de marketing interactiv, sa adopte noile tehnologii si sa devina mai preocupati de nevoile clientilor. - optimizarile la care trebuie sa recurga designul in email marketing. Te rugam sa completezi formularul de mai jos pentru a primi o copie a studiului Inbox Review 2012. Doresc ca un reprezentant White Image sa ma contacteze in urmatoarele zile. Toate datele colectate vor fi folosite exclusiv in scopul transmiterii informatiilor solicitate. Pentru detalii legate de politica de confidentialitate a White Image click aici. Loyalty through e-mail in Romania?! A new list of subscribers for e-mail marketing? How you regain inactive subscribers? Make your holiday email unique! What is the best frequency for sending newsletters? Eternal question: Video in email? How to pass from 'Received' to 'Read' in email marketing? Newsletter design, deliverability & interactivity. Do you think that a newsletter may be projected anyhow? The power of call-to-action - Make them click! Email marketing: arts or science? What about a unique email for each of your subscribers? How to maintain a good online reputation? Do we correctly evaluate the success of an email marketing campaign? Which is the perfect moment for sending newsletters? How do email and social media work together? INSIDE 2011, the 6th edition. 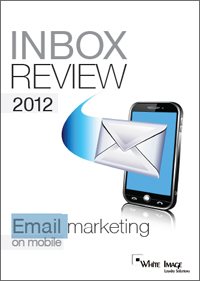 2010-2011 email marketing trends. Effectively manage aspects of email marketing campaigns: list management, deliverability and analysis.